In 1708, British ships sunk a Spanish galleon called the San José that contained a cargo of gold, silver, and emeralds believed to be now valued at billions of dollars. 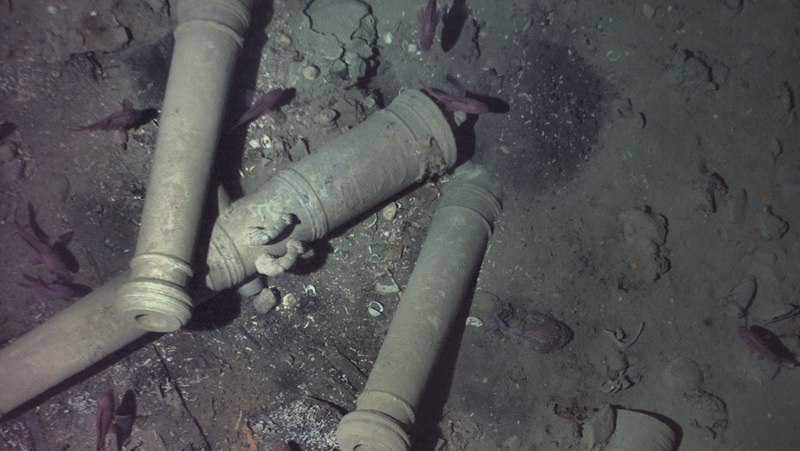 Now it's been revealed that in 2015, a robot found this "holy grail of shipwrecks" off the coast of Cartagena, Colombia. The efforts were led by Maritime Archaeology Consultants with Woods Hole Oceanographic Institution scientists using an autonomous underwater vehicle named REMUS 6000. Because of a legal battle between the Colombian government and an American salvage company over the treasure, the institution was not authorized to reveal its involvement in the discovery until Monday. REMUS, a 13-foot-long and 26-inch-wide torpedo-like vehicle, was able to snap photos of a few distinguishing features of the ship, including its unique bronze cannons and dolphin engravings, the (Woods Hole Oceanographic Institution) statement said. “The San José discovery carries considerable cultural and historical significance for the Colombian government and people because of the ship’s treasure of cultural and historical artifacts and the clues they may provide about Europe’s economic, social, and political climate in the early 18th century,” the institution said. The treasure has been the subject of legal battles between several nations as well as private companies. Several weeks ago, UNESCO, the United Nations cultural agency, called on Colombia not to commercially exploit the wreck.